The Pope’s first appointment to his curia was made today when he named the Minister General of the Friars Minor, Father José Rodríguez Carballo, OFM, Secretary of the Congregation for Religious (official name: Institutes of Consecrated Life and Societies of Apostolic Life). Carballo will assist the Brazilian cardinal João Bráz de Aviz. Father José Rodríguez Carballo was born in 1953, professed temporary vows as a Franciscan in 1971 and ordained a priest in 1977. The Archbishop-elect is a Spanish Franciscan who has served the Friars Minor in a variety of capacities. 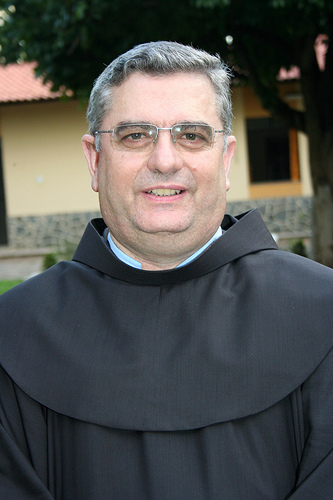 In 2003, Father José Rodríguez Carballo was elected the 119th successor of Saint Francis of Assisi when he was elected Minister General of the Friars Minor. In 2009, he was elected to the same work. Friar José was trained in Scripture studies. He was appointed to the Synod of Bishops in 2005, 2008 and 2012. He’s been a member of the Congregations of Evangelization of Peoples and the one he’s the Secretary to. Carballo succeeds in the office the American Redemptorist Archbishop Joseph Tobin who is now the archbishop of Indianapolis. The Vatican Insider has an article on the appointment of Carballo that gives some stats.